Nickelodeon has announced that season four of their popular Big Time Rush series will premiere on May 2nd at 8pm. They’ve ordered 13 episodes and have numerous guest stars lined up. NEW YORK, April 18, 2013 — Nickelodeon’s hit live-action comedy series Big Time Rush kicks off season four on Thursday, May 2, at 8 p.m. (ET/PT). Created by Scott Fellows (Ned’s Declassified School Survival Guide) and produced in partnership with Sony Music, this season finds best friends Kendall Schmidt, James Maslow, Carlos Pena and Logan Henderson, recording music for their third studio album and preparing for the launch of their next world tour. The guys quickly discover that the music landscape has become more competitive and the pressure to stay relevant proves tougher than ever. 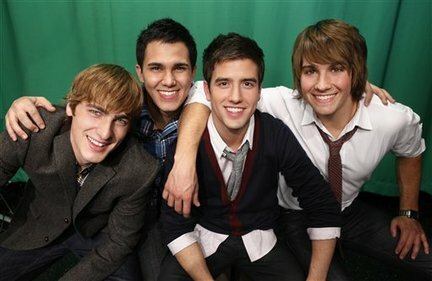 Big Time Rush airs regularly Thursdays at 8 p.m. (ET/PT) on Nickelodeon. Big Time Rush is set to release their highly anticipated third album, 24/seven, in June. The release will feature “Like Nobody’s Around,” as well as brand-new music which will appear on the upcoming season of the show. The band will perform tracks from 24/seven when they hit the road on their “Summer Break Tour” with Victoria Justice . The tour kicks off June 21 in Los Angeles and will stop in over 38 cities across the U.S. For more information on the tour, please visit www.SummerBreakTour.com. Nickelodeon, now in its 34th year, is the number-one entertainment brand for kids. It has built a diverse, global business by putting kids first in everything it does. The company includes television programming and production in the United States and around the world, plus consumer products, online, recreation, books and feature films. Nickelodeon’s U.S. television network is seen in almost 100 million households and has been the number-one-rated basic cable network for 18 consecutive years. Nickelodeon and all related titles, characters and logos are trademarks of Viacom Inc. (NASDAQ: VIA, VIA.B). What do you think? Will you or someone in your home be watching the premiere? More about: Big Time Rush, Big Time Rush: canceled or renewed?